Released several months back in the US and other markets, the Motorola Moto G5 Plus is normally sold for $229.99 (model with 2 GB of RAM and 32 GB of internal memory), or $299.99 (model with 4 GB of RAM and 64 GB of internal memory). 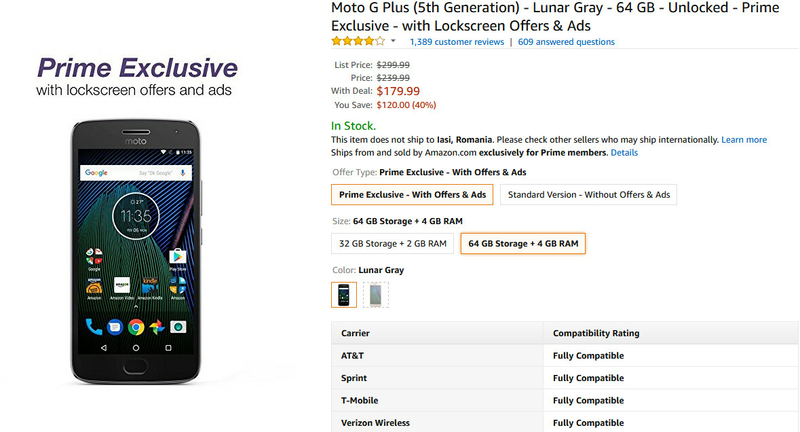 Motorola also launched the smartphone as an Amazon Prime exclusive product (with Amazon offers and ads on the lockscreen), offering the 4 GB / 64 GB version for $239.99. Now, this version can be purchased for even less: just $179.99. Thus, you're saving a total of $120 for accepting Amazon ads on your lockscreen. These ads and offers aren't really intrusive anyway, so you won't be annoyed by them. At the moment, you can also get the Amazon Prime Moto G5 Plus with 2 GB of RAM and 32 GB of internal memory for $154.99, but, really, we'd say it's worth paying an extra $15 to purchase the 4 GB / 64 GB model for $179.99. You can find both variants of the handset at Amazon via the source link below. Sold unlocked, the Motorola Moto G5 Plus runs Android Nougat, and is fully compatible with all relevant US carriers, including Verizon, AT&T, T-Mobile, and Sprint. To find out more about the smartphone, check out our Moto G5 Plus review. Makes you really think how Apple can charge so much for an iPhone 7. This has the same screen resolution as an iPhone 7 plus, but it's physically smaller than an iPhone 7 plus. Yet it has double the ram and storage of an iPhone 7. Plus it's expandable storage. FM radio, fps, 3.5mm audio jack. Not to mention that the battery life is better than the iPhone 7 plus. The Nokia 6 that I have in my hand makes me think about how Apple can charge so much. This phone is a work of art. Get rid of those top & bottom bezels and I'll think about buying. I consider myself a bit of a tech nerd, read all of the blogs, stay up on the new devices, etc. I've used iPhones and Nexuses in the past and have always figured that I'd eventually splurge when Samsung got the Note just right. Anyway, I got the Blu R1 HD with ads ($60) a couple of months ago just to see how it was, and I have to say that I don't know how I'm ever going to get myself to pay 10-15 times as much for another phone. It is not perfect by any means, but it is ridiculous how good these budget phones are, and the ads are not nearly as irritating as I'd thought they'd be. Once you get used to them, you don't even think about them anymore.